Skyrim VR. It's been on everyone's mind since virtual reality became a viable technology again, the go-to example of how we'll know that the tech is worth investing in. And now we have a release date for this standalone experience: November 17. Bethesda announced the date, along with release dates for Doom VR and Fallout 4 VR - December 1 and December 12, respectively - in its 7.5-minute long QuakeCon welcome video, which you can watch below. Or you can skip to 3:36 if you just wanna see some of Skyrim VR's motion controls in action. QuakeCon runs from August 24 to the 27, and attendees will be able to try these virtual reality twists on old favorites for themselves on the show floor. We've got tickets, so expect impressions soon. 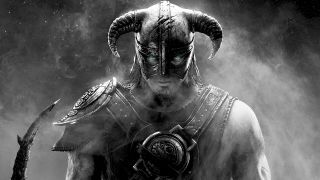 Is Skyrim VR really the dream so many hope it will be? We'll find out.